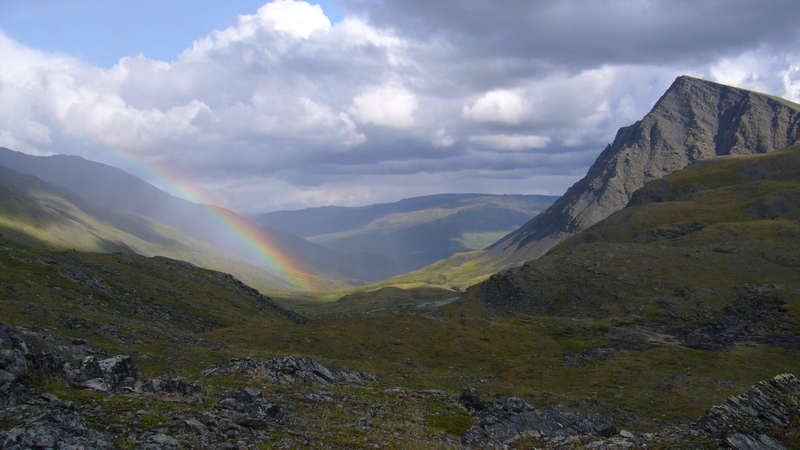 The pot of gold at the end of this rainbow is wilderness in Gates of the Arctic. Photo courtesy of Lisa Oakley. Mining interests want to cut through public lands and wildlife habitat to build a state funded access road to the Ambler Mining District. The proposed Ambler project endangers wildlife and people. The State of Alaska has already dumped millions of dollars into the proposed project, despite the state’s fiscal crisis and the road’s threat to fish, wildlife, and subsistence uses. 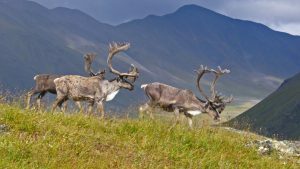 Trustees joined Alaskans, tribes, and local and community groups in voicing the significant concerns about the proposed road’s impact on Alaska fish, wildlife, subsistence food, and communities throughout the Southern Brooks Range. The National Environmental Policy Act requires federal agencies to consider all the environmental and social impacts before issuing a permit to the state. The Western Arctic Caribou Herd on its annual migration. Photo courtesy of Lisa Oakley. In comments submitted on behalf of clients, Trustees encouraged BLM to take a hard look at the environmental, social, and economic impacts of the proposed road, while also pointing out some of the negative impacts the road and mines would have on valuable fish, wildlife, and subsistence resources. The comments further reiterated the importance of listening to local voices when considering whether to grant a right-of-way to build the proposed road. Widespread local opposition to this project centers on concerns for wildlife, subsistence foods, and the unjustifiable cost to the state—a huge subsidy to the mining industry. Trustees also noted flaws in the state’s biased and inadequate permit application. The materials prepared by the Alaska Industrial and Development Export Authority omit and gloss over important information. AIDEA fails to thoroughly explain how the road will be constructed over a multi-phase period; it fails to talk about how what it calls a “temporary” road will be reclaimed and returned to its original state when no longer used by the mining industry; and it fails to clearly lay out a schedule for construction, maintenance, and upgrades. It also entirely avoids discussion of mining operations in the Ambler District, and all of the associated negative impacts that mining will bring to wildlife, air and water quality, and fish resources in the region. The State cannot tout the questionable economic benefits of the project opening up access to a mining region, while at the same time expecting BLM and other agencies not to analyze the impacts of mine development. BLM needs to consider impacts to the entire state. The project’s price tag would be hundreds of millions of dollars, some say $950 million or more, in a state that already faces a budget deficit in the billions. The state has spent more than $22 million of public funds on permitting this proposed road so far. That number will just keep rising, leaving Alaskans with another floundering project that yields nothing but more debt. Despite these statements, the Governor turned around just days after the comment period ended and announced his intention to continue funding the project past the scoping phase. Governor Walker did this despite the fact that tens of millions more dollars are likely necessary to fully complete the permitting process for the road. We hope BLM will use the scoping comments to listen to and address the concerns of the people, tribes, and local and community groups looking out for Alaska fish, wildlife, subsistence food, and communities throughout the Southern Brooks Range.